I would consider myself to be much more of a cook than a baker. Baking takes precision and is such a chemistry based skill that I am at the mercy of a great recipe to come up with some of my favourite desserts. 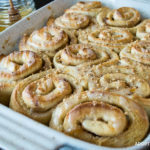 I found a great recipe for cinnamon bun dough years ago and have hung on to it ever since. I have adapted the original by omitting the sugar and butter, and replacing it with honey and peach jam. The peach jam I used is from The Jammery in Kelowna. One of my favourite spots for breakfast when wine touring in BC. The honey is care of Kemp honey, a local producer who happens to be a dear friend of mine. 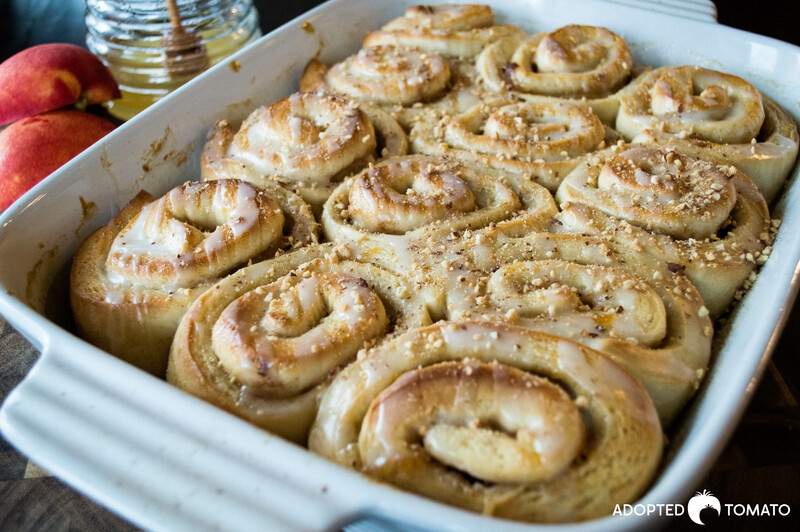 The end result is a yummy twist on the normal cinnamon bun flavours. It has been “teenager” tested and the thumbs shot up in the air so we have a winner here. The additional bonus is these freeze really well so you can enjoy them for weeks. 1/2 cup toasted almonds chopped finely in a food processor. The recipe beings with the bread machine. Add the following items to your bread machine in this order: milk, eggs (beaten slightly) melted butter, flour, salt, sugar, yeast. Place the machine on the dough cycle. Once the dough is ready, roll it out to a large rectangle approx 11″ x 14″. Using a butter knife, spread the honey over the dough leaving 1/2 inch around each edge. Melt the peach jam in a small pot on the stove adding 1 tsp of water. Drizzle the peach jam over the honey, sprinkle the cinnamon evenly over the rolls and then sprinkle the almonds generously reserving 1 tbsp. Roll the dough on the long edge gently as not to roll to tight. Give it room to rise. Finish rolling with the “seam” down. Once rolled, cut into 12 equal sized portions. Place those portion flat one a progressed 9×12 baking dish. Set aside to rise for 20 minutes. While the dough rises, preheat your oven to 400 degrees. When the rolls are ready, bake in the preheated oven for 17 minutes. Remove from oven and allow them to cool on a wire rack in their pan. To serve, mix 1 cup of confectioner sugar with 1 tbsp of water and 1/4 tsp of almond extract. Drizzle over the cinnamon buns. Sprinkle the remaining tbsp of almonds over the glaze. Enjoy.